we are still in the process of getting this record done. artwork is on the way. we have had a few difficulties with the mastering process but it will be soon done. the record will be available in the first half of 2016! behold. about the rewards you’ll get: we will ship them out together with the record – don’t worry you’ll get everything! 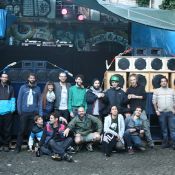 reminder: 12.12.2015 dubtopia VII w/commodo on the collynization soundsystem. so there we go. we’ve reached and even topped the goal. we are now in the process of getting the lacquers done etc. it has also already been decided what tunes will be on the first dubtopia record. We want to thank each one of you and also ask you kindly for a bit of patience! no worries, noone as fled with 2700.- to the bahamas! and your gifts will be sent out most probably with the record. also remember: 15.08.’15 dubtopia VII @rössli, Reitschule in Bern. we reached our goal of 2000.-! thank you so much – there are no words to describe how grateful we are! we reached our minimum! Every penny on top of it will support the artists involved! from our friends who invest hours in screen printing to the producers involved we have many places to fill the gaps! so keep on supporting us and spread the word!